Throughout a particularly destructive hurricane season, public media has relied on collaborations — stations working with each other, with national organizations like CPB, NPR and PBS, and first responders and commercial media — to better serve the public. After Hurricane Maria hit Puerto Rico on September 20 and wiped out almost all broadcasting on the island, public media organizations from the East Coast to Alaska rallied to get public radio stations WIPR-FM and WRTU/WRUO-FM back on the air. CPB and the Latino Public Radio Consortium worked together in the hurricane’s aftermath to assess the situation and coordinate support among CoastAlaska, which donated two portable radio station kits; WNYC-New York and WMFE-FM Orlando, which offered engineering expertise; and Alaska Airlines, which provided free shipping for the 4,300-mile flight. CoastAlaska, a network of public radio stations in southeastern Alaska, created a portable radio station kit in 2011 for its stations, many of which are in remote locations, to use in case of emergencies. “Radio To Go” fits into four cases everything a broadcaster needs to set up a small radio station. When assembled, the station can broadcast with power from car batteries wired together. A KTOO video shows one of three Radio To Go kits, created by CoastAlaska, being sent from Juneau to get public radio station WIPR back on the air in Puerto Rico. With help from WNYC engineers, WIPR-FM got back on the air in San Juan in mid-October. And with WMFE’s help, WRTU and its repeater station WRUO are expected to get back on the air this week from Mayagüez in the western part of Puerto Rico. In late August, when Hurricane Harvey flooded southeastern Texas, Houston Public Media provided extended coverage on its multicast channels, simulcast to KEDT-FM in Corpus Christi and provided coverage to national and international media. The joint licensee, a member of the CPB-supported Texas Station Collaborative, relied on the partnership with KUT-FM in Austin, KERA TV/FM in Dallas and Texas Public Radio in San Antonio to augment round-the-clock coverage statewide, while contributing to national coverage on NPR and the PBS NewsHour. Meanwhile, the Florida Public Radio Emergency Network (FPREN), a collaboration of 13 public radio stations covering Florida, provided more than 81 hours of live, continuous coverage as Hurricane Irma moved across the Florida Keys and up the Gulf Coast in mid-September. 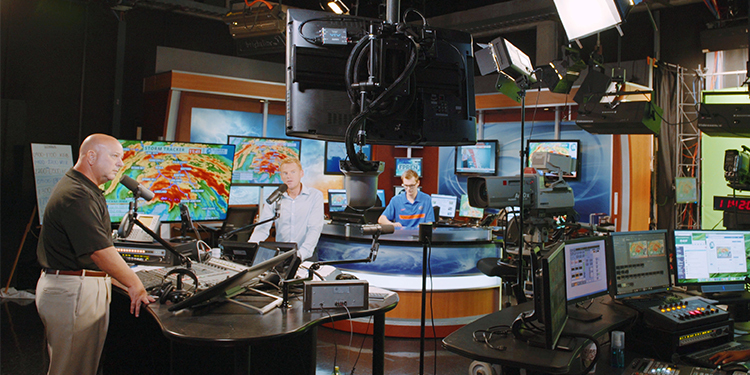 FPREN, headquartered at the University of Florida’s WUFT-FM/TV in Gainesville, provided multiple hurricane-focused live radio segments every hour before, during and after the storm, featuring meteorologists and hosts providing critical information. Coverage was broadcast on the FPREN-partner radio stations covering the state of Florida; on station’s website; on social media channels, including Facebook Live events; and on mobile devices via the Florida Storms app. The free app, downloaded more than 100,000 times, provided geotargeted information such as live hurricane forecasts, evacuation routes and shelter details in addition to live streaming the closest Florida public radio station — a particularly valuable feature for those evacuating from one part of the state to another.